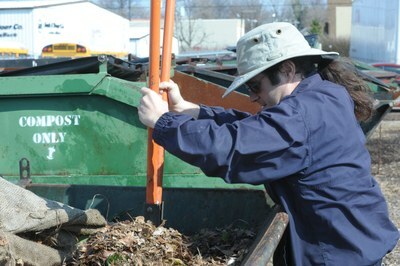 UofL is committed to seeing organic wastes as a valuable resource rather than as "trash" to be thrown "away." Sustainability requires us to not only reduce waste, but to re-conceptualize waste as resource and to seek ways to creatively 'close the loop'. UofL is achieving this most directly in the way we handle our organic wastes. Most food waste from UofL Dining facilities is composted off-site via subcontract through WestRock Recycling, but there are many other smaller local organic waste streams that you can help us turn into valuable organic fertilizer! > Video: UofL Trash Mob Flash Mob! The project continues today as a service opportunity associated with UofL's EcoReps Program and has evolved into a community composting partnership with our neighbors. At our peak in 2016, we were composting about 4230 pounds/week of food wastes with the power of human labor! To get involved in the partnership and help keep the cycle of life thriving, contact Project Director, Brian Barnes, 502-338-1338. We need volunteers every Sunday from noon-2pm at our composting site, which is at the north end of UofL's Grounds Lot on the 200 block of E. Bloom St. just one block north of Cardinal Blvd. between Brook and Floyd Streets (map here). Community Partners: Blackacre State Nature Preserve, Heine Bros Coffee, GenScape, Naive Restaurant, WaterStep, UofL Garden Commons, Fern Creek High School, UofL Urban Planning and Public Affairs Horticulture Zone, WestRock Recycling, UofL Dining (including Starbucks), Brown-Forman, Foodworks Louisville, and dozens of anonymous individual community partners. In the past we have also processed organic wastes from UofL Campus Housing. UofL Departments or Units Involved: Office of the Provost (Sustainability); Sustainability Council; Mathematics; Philosophy; Urban Planning and Public Affairs; Theatre Arts; Physical Plant; UofL Dining; Athletics; Eco-Reps Program; UofL Engineers Without Borders. Project History: Beginning in December of 2009, Brian Barnes, a UofL Philosophy instructor, conceived and built a food waste composting facility at UofL. Barnes noticed a pile of decommissioned campus dumpsters from UofL's old recycling system and worked with the university to repurpose the dumpsters into large compost bins for campus food wastes. Since beginning operation in July 2010, the UofL Community Composting Project has diverted hundreds of tons of pre-consumer food waste and coffee grounds from landfills into the production of rich, fertile soil that enhances not only the UofL Garden Commons (our initial partner), but many other gardens, orchards, and landscape projects around the university and the city. 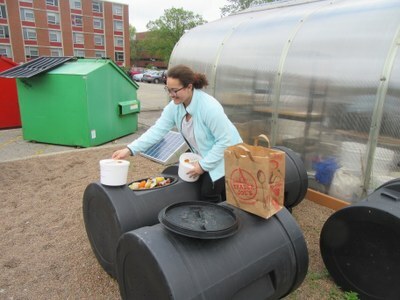 In March 2011, the project was profiled in UofL Today: Food composting comes to campus. Starting in 2011, all compostables were transported to the site in surplus UofL Physical Plant vans. Today we use a Physical Plant pickup truck after hours. In November 2014, we began partnering with Heine Bros Coffee to gather coffee grounds and other compostables from the 17 Heine Brothers Coffee locations around Metro Louisville, serving organic, fairly trade, locally-roasted coffee. In 2014-15, we piloted an expansion into campus residence hall collection of food wastes in both Miller Hall and Louisville Hall. That pilot demonstrated the value of the service to Campus Housing which organized to expand the pilot to all residence halls in 2017. In January 2017, we rolled-out weekly collection of organics in all Belknap Campus Housing facilities for on-site composting but the quantity of waste captured did not justify continued collections. How It Works: The Project picks up organic wastes from its community partners once or twice weekly. 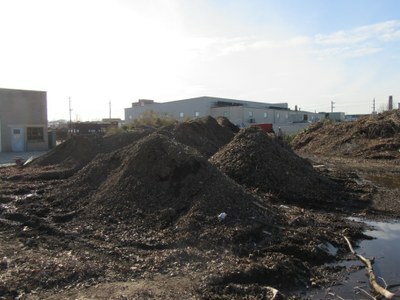 These donations of primarily food waste and coffee grounds are mixed on-site at UofL’s Floyd Street Mulching Facility. Volunteers layer the waste in reclaimed dumpsters, along with mulched yard waste from community partners, like leaves and tree limbs. Periodically, full dumpsters of waste are aerated by volunteers climbing into the dumpsters and digging holes. Hand tools are used in all aspects of the operation. Composting requires water, and we have modified the dumpsters to maximize precipitation capture; we also use a hose to occasionally water the bins. Volunteers maintain a small herb and vegetable garden, along with a berry patch, between and among our dumpsters. How The Compost Is Used: Much of the compost is donated to community partners, but a portion is used to feed our worm population. Running the finished compost through a worm’s digestive tract results in vermicompost, which is nature’s super soil. We maintain a population of red wiggler manure worms (eisenia foetida) for creating the vermicompost, which we harvest periodically to donate to our community partners and university gardens. The worms live and work in modified plastic flavoring barrels provided to the project by Brown-Forman Distillery. Spin-off Projects: Back in 2014, the project began experimenting with mycoculture and aquaponics, as well as improving its rainwater capture systems. The composting project has also experimented with growing a variety of food crops in small garden areas on site. We are always looking for new sustainability project ideas to experiment with on-site! Education: Due to our strong educational orientation, one of the goals of the project is that it always be accomplished in such a way that any or all of its systems could be replicated by other communities, or even elsewhere in our own community. We also strive for a negligible carbon footprint. Learn how you can do this! The UofL Sustainability Council provided Brian Barnes a stipend for administrative costs since 2012-2017 and this funding resumed July 2019. 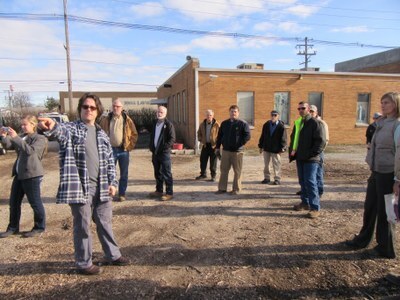 The project also receives financial support as a result of the partnership with the Louisville Composting Co-op, Heine Bros Coffee, GenScape, and other local businesses and organizations that we collect organic wastes from. Donations of funds and tools are always welcome to help us keep this operation going. Contact: Brian Barnes, 502-338-1338. 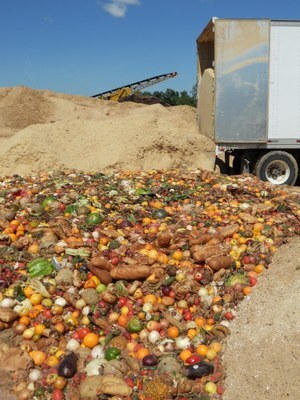 Tons of Food Waste Composted On-site: 2010: 20 tons. 2011: 20 tons. 2012: 13 tons. 2013: 25 tons. 2014: 33 tons. 2015: 74 tons. 2016: 110 tons. 2017: 81 tons. Impact on UofL: UofL has become known for its sustainability initiatives. 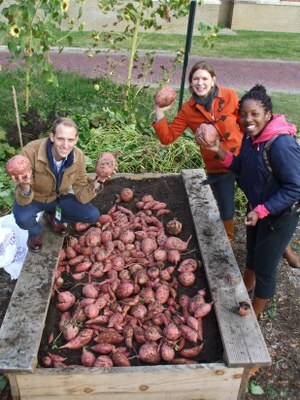 Closing the loop on food waste on campus has been a powerful example of what is possible with reused resources, imagination, volunteers, campus partnerships, and sustainability initiatives. It is also the case that this project has been accomplished with very little funding, which has also helped it become a model. The project provides high quality soil to planting projects around campus, including two community gardens and a wildflower garden. This project has evolved to include more on-campus and off-campus opportunities for students to engage and learn about sustainability in a very hands-on approach. 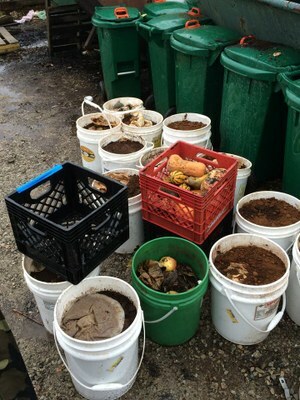 Beginning in 2011, faculty, staff and students were given the opportunity to compost their own food scraps at the Garden Commons located on campus. In March 2012, inspired by these efforts, UofL established a contract for collection and pick-up of all food wastes from UofL dining facilities. The Community Composting Project now operates with UofL Dining as a much smaller partner, and we are always seeking new sources of waste to reclaim from the landfill. For example, in addition to the Quills and Ekstrom Library coffee shops, we piloted an organics collection from select UofL residence halls on campus in 2014-15. That pilot has spawned plans for organics collection in all Campus Housing halls beginning in 2017. We have also implemented a partnership with UofL Athletics to collect food scraps from Athletics facilities along Floyd Street. All compost and vermicompost is donated to community partners; there is no sales structure in place to support this project. Outreach: The project has caused UofL to receive media coverage, not only from The Louisville Cardinal and UofL Today, but from WHAS-11 and other off-campus news outlets. Coverage such as this has aided the project into evolving into the multifaceted composting initiative that it is today involving many community partners. This project is also the foundation service project for supporting the Garden Commons and the Eco-Reps programs on campus. Recently, the Project was contacted by The Composting for Community Project at The Institute for Self-Reliance in Washington, DC, to provide information about its operations as part of a national education program. 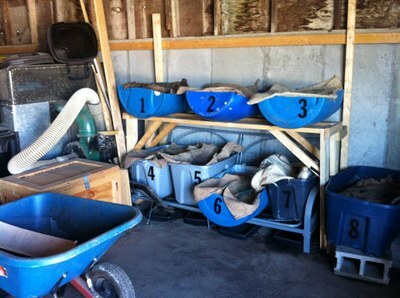 That document can be found here: Growing Local Fertility: A Guide to Community Composting. Information about UofL’s program was also featured at the October 2013 Cultivating Community Composting conference in Columbus, Ohio. Student Involvement: Student participation is robust, though episodic. Students in Business Ethics classes study this organization as a sustainable community model, and they contribute their labor as part of their research; we are involved with SOUL and the Office of Student Involvement, which sends volunteer groups our way at least annually; the project serves as a model to be studied for Barnes’ senior seminar in sustainability and social justice at Bellarmine University; we are becoming known in the community as a composting partner (as one example, The Louisville Zoo contacted us about a donation of compostables from an event); and we receive contact weekly from groups and individuals interested in learning more about what we do. One volunteer, Angie Carlson, made a huge splash, in part, for work with the project, featured in Sierra magazine. Impact on Community: The UofL Composting Project provides a working model of an environmentally-sound and sustainable urban composting system. In addition to keeping considerable quantities of trash out of landfills, the project provides soil to community partners for gardening, growing of food, and educational events. The project brings together diverse community partners around the topics of healthy soil, good food, and learning the truth about our trash. 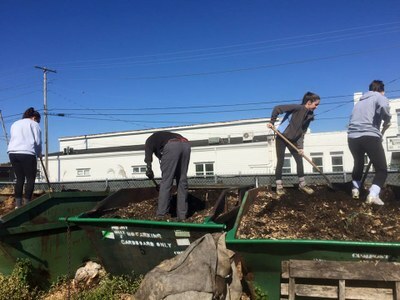 The Community Composting Project is becoming known around Metro and the US as a model of sustainable action with low cost, low carbon footprint, and high impact. 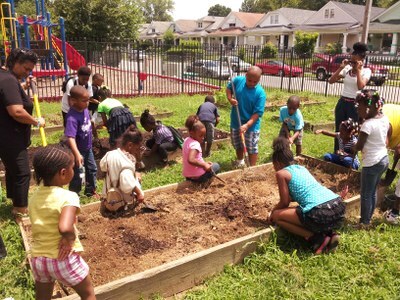 We have given soil to dozens of community gardens, non-profits, and individuals around the Metro community during our operation. The project is a unique point of innovative convergence with other sustainability groups like WaterStep and Engineers Without Borders. • Numerous presentations/tours for regional universities, including University of Kentucky, Indiana University, Western Kentucky University, etc. We Need Compost! 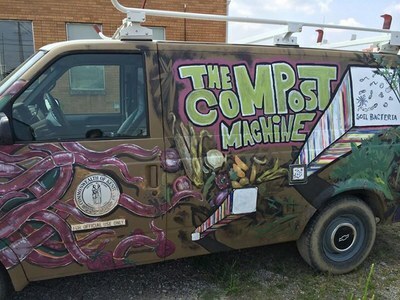 (featuring many of our friends in the Louisville-area composting scene!). There are several places at UofL where you can participate directly in making rich, organic fertilizer for use right here on campus! - UofL's LEED Gold certified Center for Predictive Medicine on the Shelby campus features a "Birthday" Garden with a compost bin. We seek volunteers willing to set up a compost bucket (with sealed lid to reduce odors and pest problems) in their campus kitchen or break-room who can regularly bring the bucket over to the Garden Commons to be emptied and rinsed. Contact: Brian Barnes, EcoReps Director: 502-338-1338. In an effort to scale-up food waste composting efforts, in March 2012, UofL established a new sub-contract for collection and pick-up of all food wastes from UofL dining facilities as well as our Early Learning Campus. This contract is now managed by WestRock Recycling. This allows us to compost both pre- and post-consumer food wastes, as well as meats, bones, and dairy-products, all of which are now collected and composted into organic soil amendments by Smith Creek of Borden, Indiana, about 20 miles northwest of campus. In 2016 alone, this system kept 400,340 pounds of food waste out of the landfill! UofL's research facilities generate as much as 450 tons/year of waste animal bedding. This material used to be landfilled, but in February 2012, UofL began sending this waste stream to off-site composting facilities, where it is turned into an environmentally-responsible soil amendment. Today it is collected by Waste Management and composted at the Outer Loop Recycling & Disposal Facility, just 8 miles from campus. In 2016, we composted nearly 274 tons of animal bedding from UofL facilities! The University of Louisville Grounds Maintenance Department utilizes selected green waste created from the care of the lawns, landscape and trees on Belknap campus to create compost/mulch on site. This includes chipped/shredded tree limbs, shrub trimmings and leaves. These materials are "tub ground" once or twice per year for mixing and particle size reduction. They are then piled based on their age and turned regularly for aeration. No artificial irrigation is used for the operation. After the materials have decomposed to a satisfactory state, they are used as mulch in campus landscaping or given to the university community.